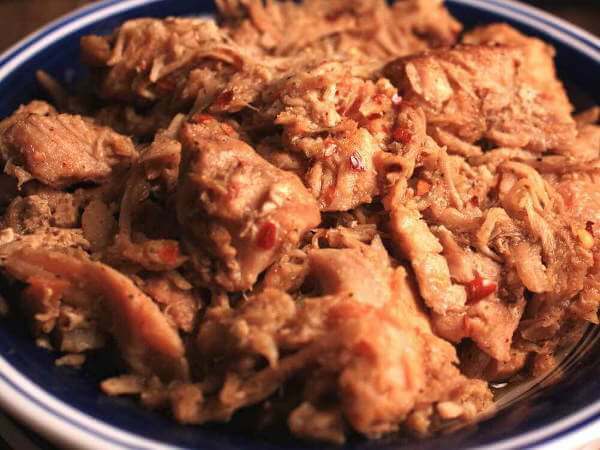 Smoking Pork Picnics: How to Smoke Pork Picnics That Taste Great! Smoking Pork Picnics Takes a While, But It's Worth Wait! When you finally try it, you'll find that smoking pork picnics takes more than a little time out of your day. They take a l-o-n-g time! But the wait is worth it! The pork picnic roast, also known as a pork shoulder, picnic shoulder, shoulder picnic, and arm picnic, must have been designed for smoking. There's a lot of fat and connective tissue that adds moistness and flavor to the meat. The bone helps hold the cut together when it's fall-apart tender. And the price is right. This is one of the least expensive cuts of pork (or meat, for that matter) around! Before the meat hits the smoker, it needs to be prepared and seasoned. Removing some of the skin and fat, followed by seasoning with an injectable liquid and a dry rub is all that's needed. 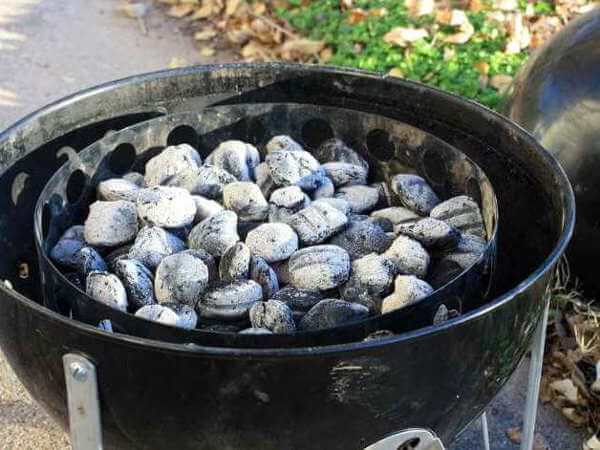 With charcoal, the trick is to set up the coals so they do a progressive burn. This is accomplished by placing most of the briquettes into the smoker unlit, mixing a few hardwood chunks in to add smoke. Then, a layer of burning charcoal is scattered on top. The unlit briquettes catch fire, then slowly burn down to the bottom of the pile. 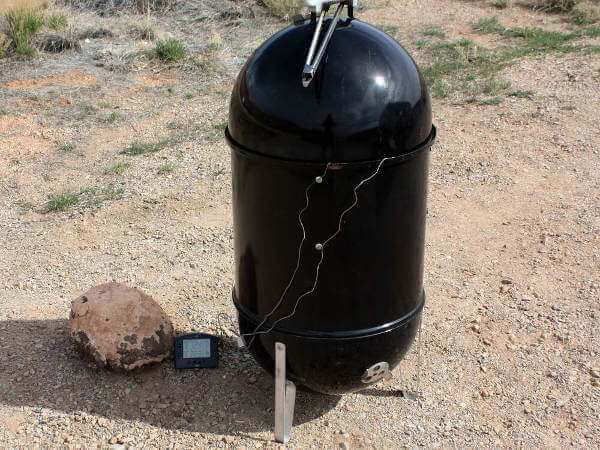 Using this method with a Weber Smokey Mountain smoker, it's possible to get burns up to 12 hours long. Right now, as I'm writing this, I'm smoking a pork picnic on my Weber. It's been cooking for 7hours, 38 minutes, and the smoker temperature is at 229 degrees Fahrenheit. I should be able to get at least a couple more hours out of the charcoal before I need to add more. By managing the burning charcoal in a water smoker, the cooking temperature can be kept above the boiling point of water, with the water in the pan providing steam for a moist cooking environment. By keeping the smoker temperature between 225 and 250 degrees, the pork picnic shoulder will take 1 to 1-1/2 hours per pound to finish. Adjust the air vents to regulate the temperature of the smoker. Use an accurate thermometer to keep track of the smoke chamber temperature, too. Cooking at a lower temperature allows smoke flavor to penetrate the meat more deeply, but will also require a longer cooking time. Meat absorbs smoke until it reaches a certain temperature, around 150 degrees. After that, the smoke will remain on the surface. 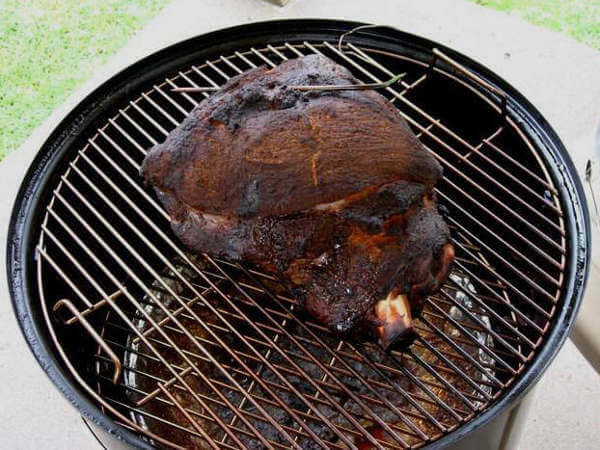 By smoking pork picnics for the first few hours at a lower temperature, say around 200 degrees, then raising the temperature up around 235 degrees, the shoulder will get good internal smoke flavor and will finish in a decent amount of time. When the internal temperature of the pork picnic reaches about 195 degrees Fahrenheit, give it the fork test. Insert a table fork and give it a twist. If the meat tears, but it takes a little force, it's about right for slicing. When the fork twists easily and the meat seems to shred, it's time to pull it off for pulled pork. One last thing. When the meat is done to your liking, remove it from the smoker and wrap it in a couple layers of aluminum foil. 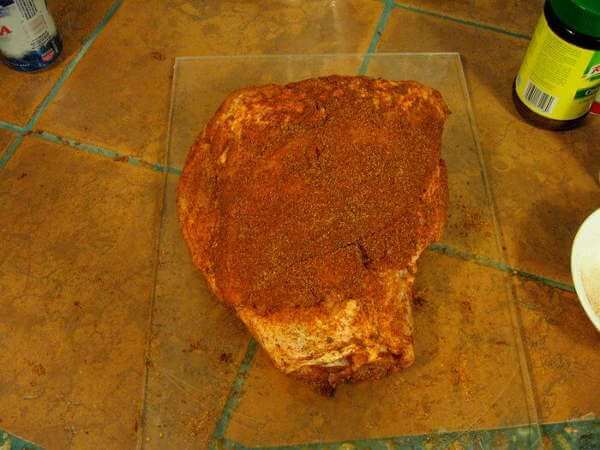 Then place the pork shoulder in a dry cooler, covered with a couple of large towels or a blanket, for an hour or two. The meat will be much juicier if you do this. Shred That Smoked Pork Picnic And Make Some Sandwiches! Before serving, separate the meat from the bone and remove all the fat and other unappetizing things you might find. Then, with a couple of big serving forks, shred it to pieces. I like to drizzle on a little cider vinegar after it's shredded. Serve with bread or buns and some crispy coleslaw. It's traditional to top the meat with some slaw before the top of the bun put in place.